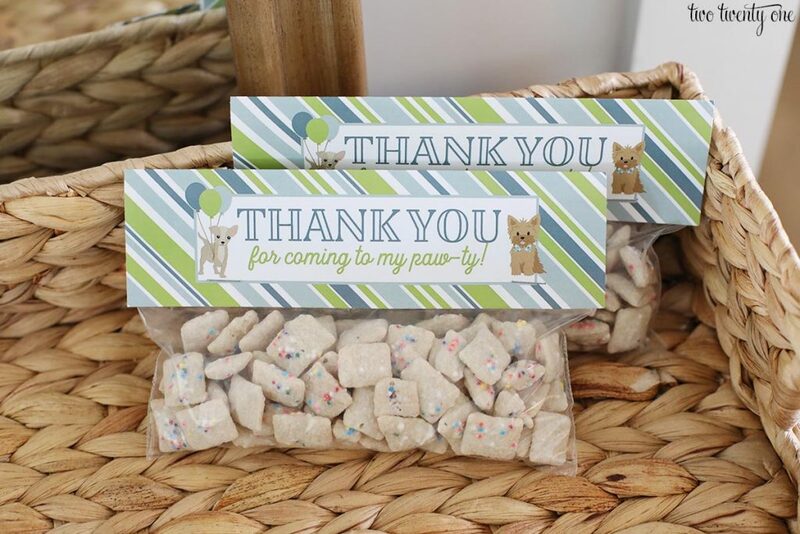 Last month, I made some birthday cake puppy chow and packaged it into favors for Emmett’s puppy themed first birthday party. I shared it on Instagram Stories as I was making it, and the majority of you wanted to know how I made it so here we are. Start by putting the Rice Chex in a large bowl with a lid. The ‘with a lid’ part is crucial. Don’t gloss over that little tidbit. I use my go-to gigantic bowl to make and store the birthday cake puppy chow. Then, get your cake mix and powdered sugar mixture together. Because you have to work sort of fast, it’s best to get your sprinkles ready too. Take that sprinkle shaker lid off. It will only impede your sprinkle dispersing speed. Meanwhile, melt the vanilla candy coating according to the directions on the package. I stir the candy coat with a rubber spatula, and then use the rubber spatula to scrape out the candy coat tray. Because why dirty multiple utensils? Once the vanilla coating has melted. 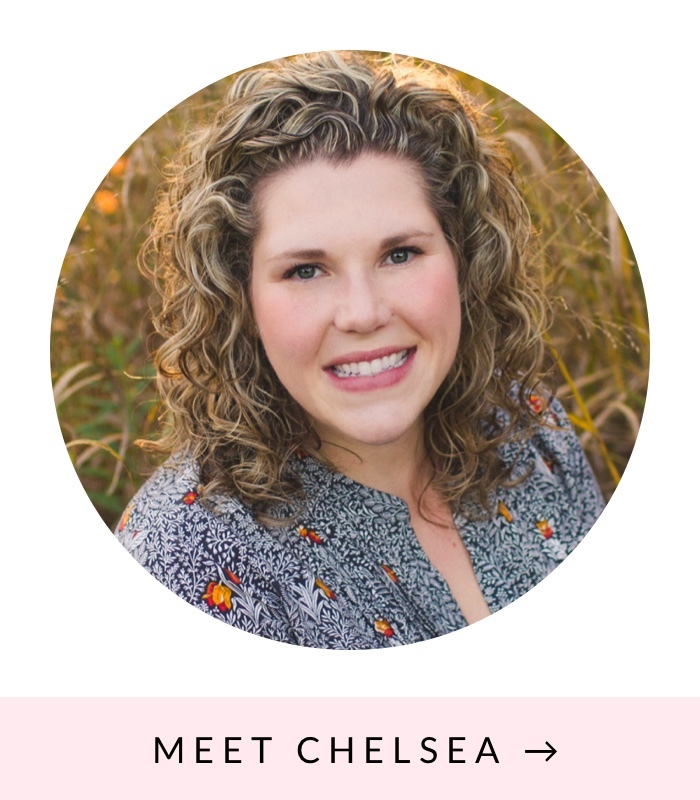 Pour it over the Chex. 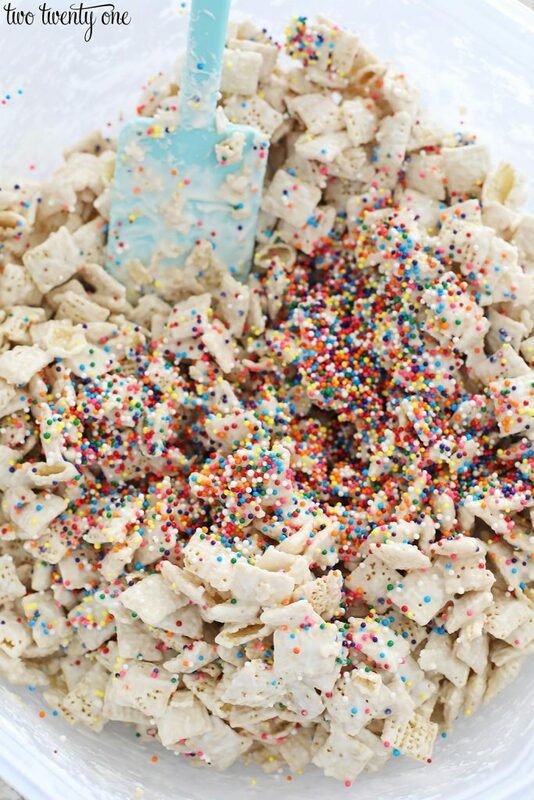 Using the rubber spatula, fold the candy coating into the cereal. Be gentle, you don’t want to Hulk out and break the cereal. 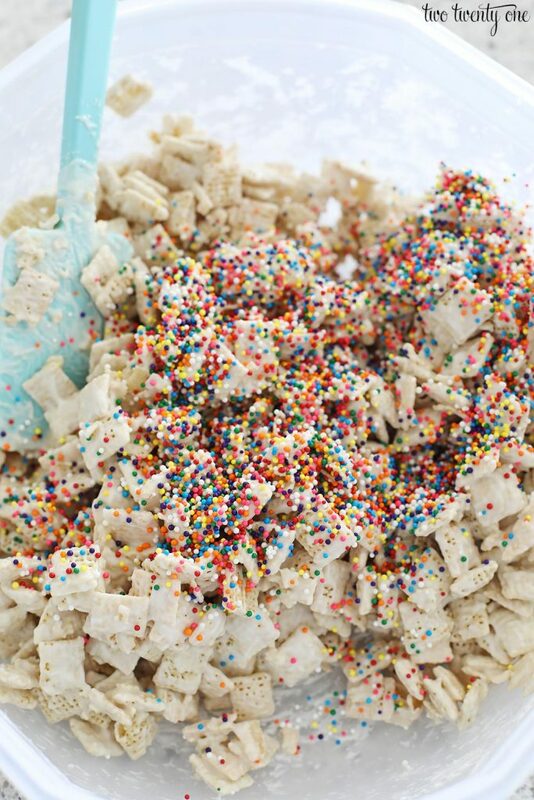 Once the cereal is as evenly coated as possible, pour a bunch of sprinkles onto the cereal. Then, fold the cereal to distribute the sprinkles. Next, add more sprinkles. I use around 2/3 of the bottle of sprinkles in total. Fold the cereal mixture some more. And remember, be gentle. 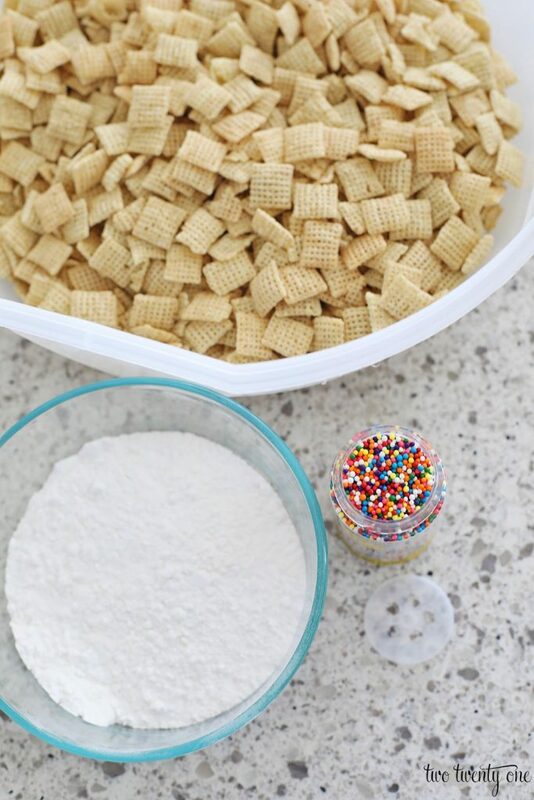 Once the sprinkles are evenly distributed, sprinkle the cake mix and powdered sugar mixture over the cereal. Put the lid on the bowl and shake. 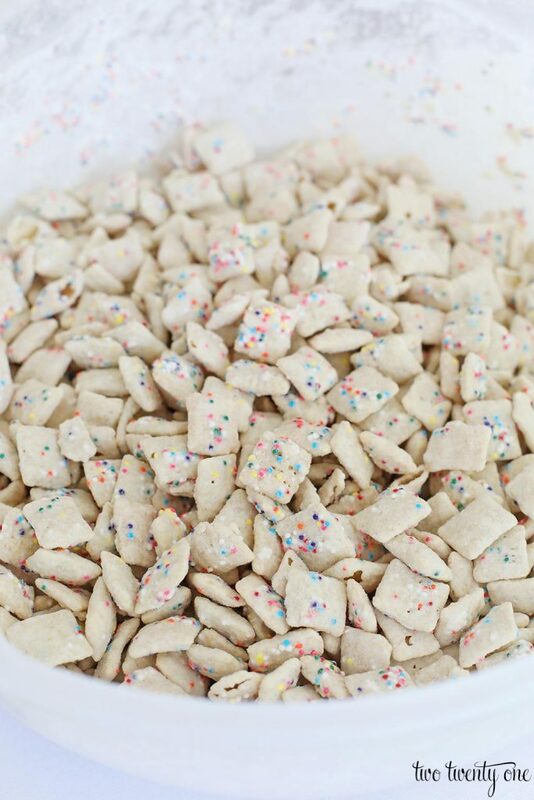 It’s like Shake ‘N Bake but instead of pork chops, you’re shaking cereal that’s being turned into a sweet snack. Remove the lid and voila! 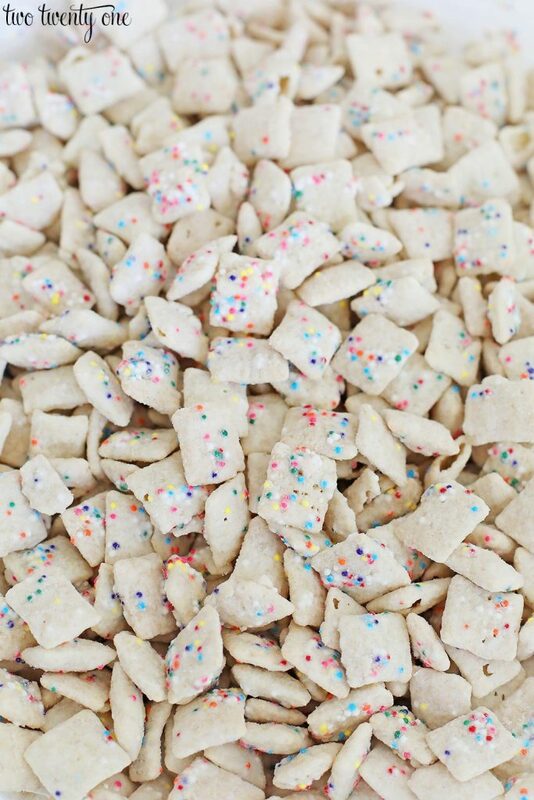 Birthday cake puppy chow. 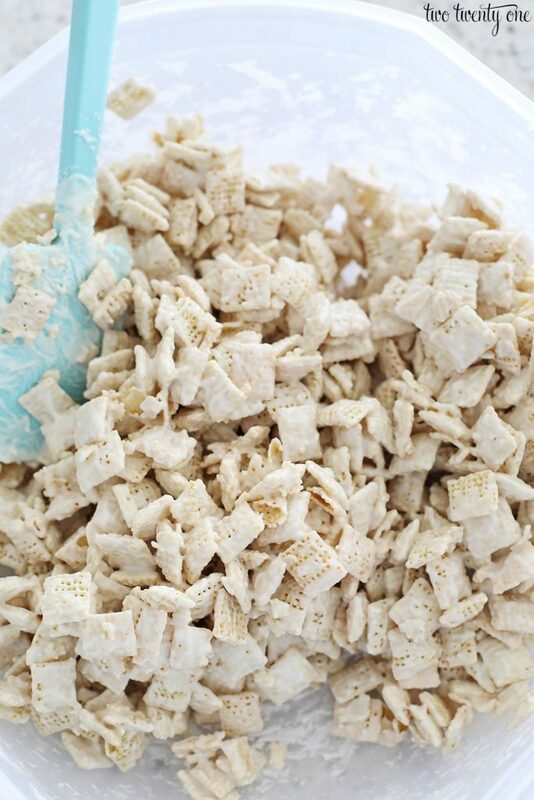 Allow the birthday cake puppy chow to cool for 15-30 minutes. I used a 1 cup measuring cup to scoop up the puppy chow and put it in snack-sized bags. 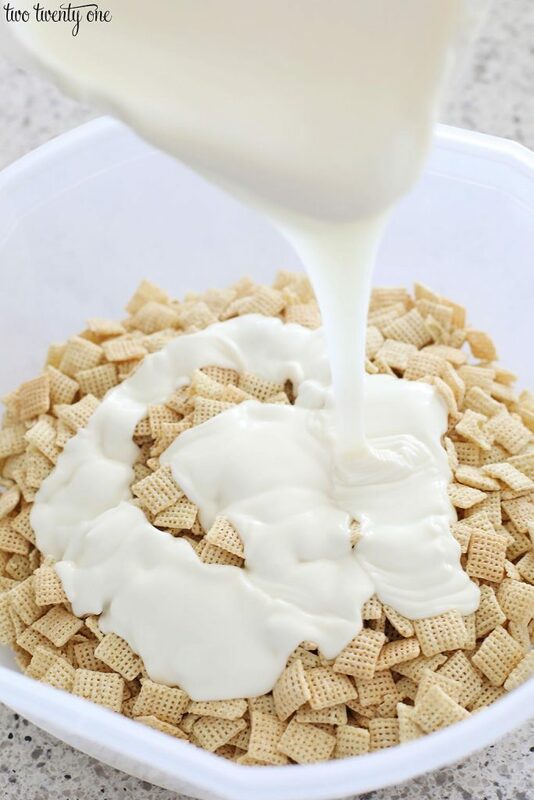 Pour Chex cereal into large bowl with lid. 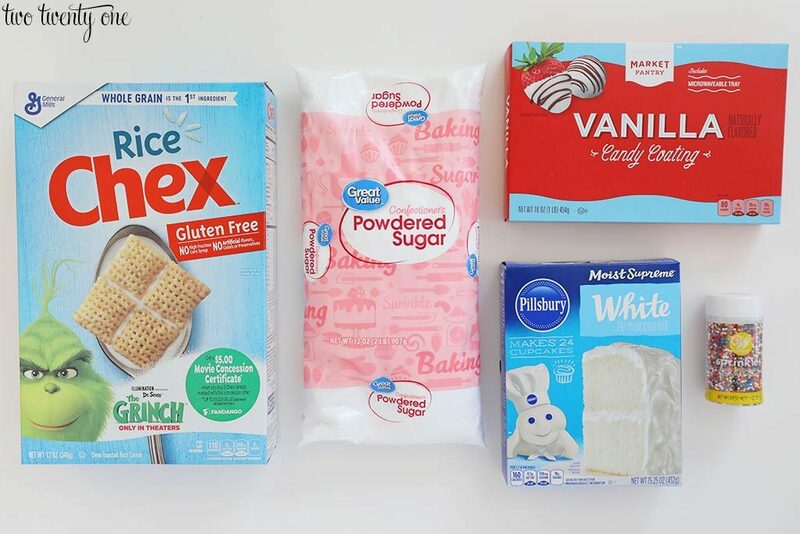 In a separate bowl, combine white cake mix and powdered sugar. Set aside. Melt candy coating according to directions on the package. 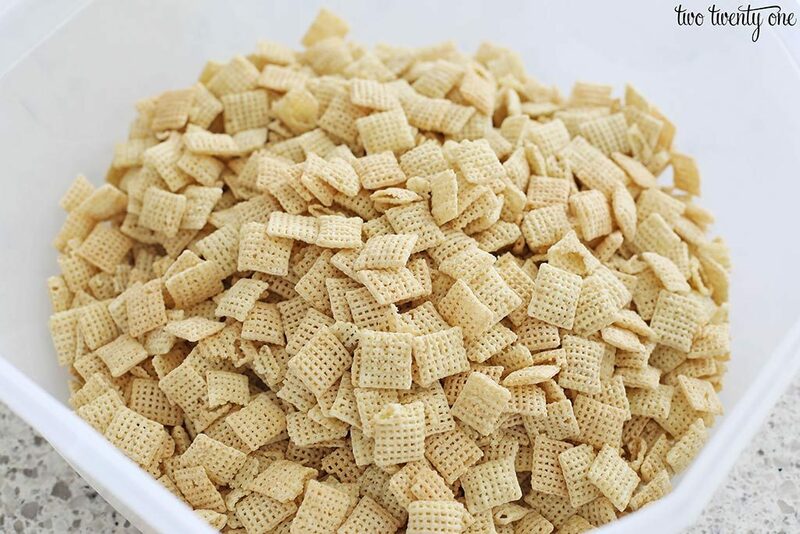 Once melted, pour candy coating over Chex cereal. Fold together. 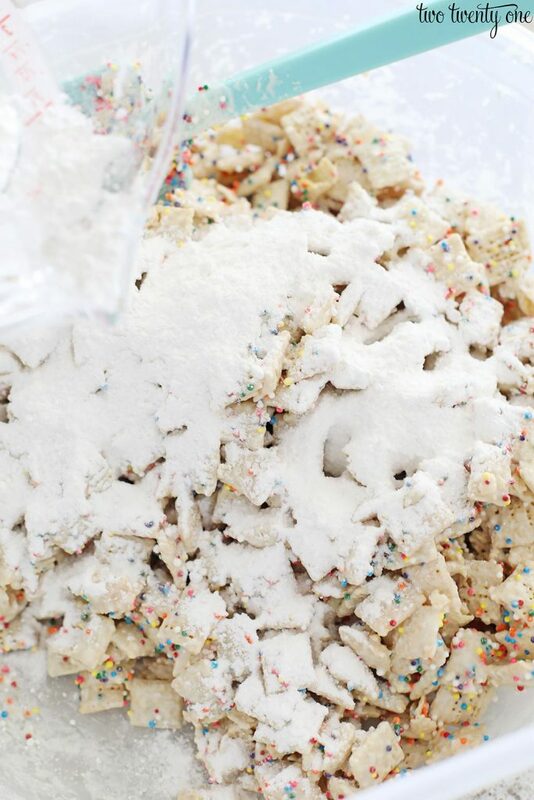 Add 1/3 of the bottle of sprinkles to the mixture. Fold together. Add another 1/3 of the bottle of sprinkles to the mixture. Fold together. 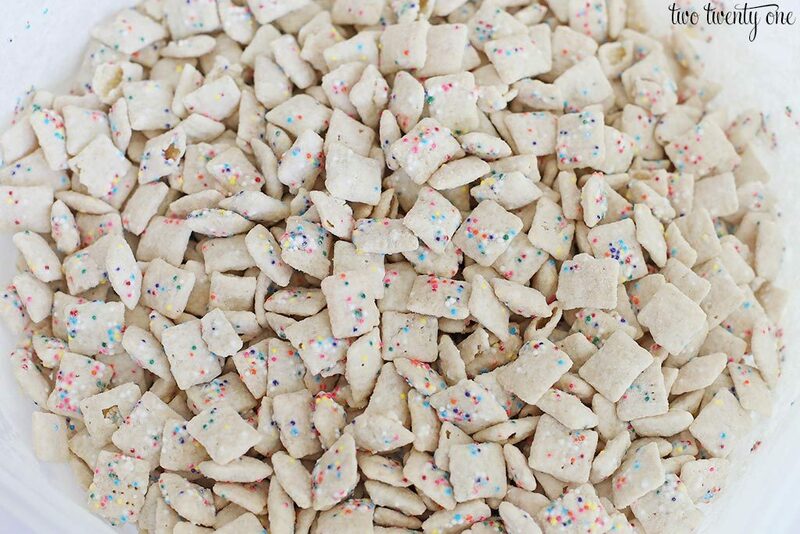 Pour cake mix and powdered sugar mixture on top of the cereal mixture. Place lid on bowl, seal, and shake all the ingredients together. and now I want a handful – thanks for sharing!